A vast majority of Americans find understanding Obama, especially his domestic economic policies overwhelmingly difficult to do. The boy’s attempts at engineering the America economy just don’t make any sense to most Americans. All it really takes though is to put aside everything that you’ve ever learned such as: American history, economics, common sense, ethics and basic morality, and the evidence brought to you by your unaltered sense. 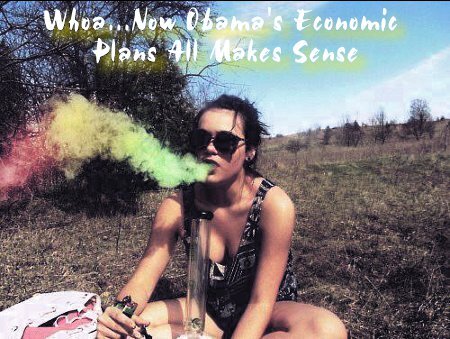 Just drop out and tune into the rainbow pipe dreams of First Black President. This entry was posted on Thursday, August 9th, 2012 at 9:59 am and is filed under Humor, Politics. You can leave a response, or trackback from your own site. Im curious, what president did you actually like? Sorry about the spam thing. The system is buggy as hell. Keeping it to relatively recent Presidents, I liked Reagan and, believe it or not, Nixon despite his eventual fall. I didn’t even particularly dislike Clinton and wasn’t too fond of Bush Jr. I am sure that a second Obama term would pretty much cause Americans to hate Democrats enough to keep them out of power for perhaps 3 or 4 terms. Even good Presidential terms eventually wear out the welcome of the sitting party. If America could survive a second Obama term it would be worth it . Of course that is not an option. 20 years of Conservative Chief Executives would not reverse the damage that our fearless leader will do to us if he gets 4 more years. Truthfully, a 2nd Obama term wouldn’t necessarily end the Dems’ chances in the future or necessarily be catastrophic to America, Alan. If Americans keep their hold on the House and retake the Senate, we can block Obama and the other filth from doing too much further harm – which the Dems will scream is “obstruction” and use to keep themselves viable as a political force.